If you are looking for Amana DigiSmart Packaged Terminal Air Conditioner PTAC #PTC123G50AXXX. You can read the information of Amana DigiSmart Packaged Terminal Air Conditioner PTAC #PTC123G50AXXX, for the deciding on a purchase. DigiSmart control board with easy-to-read control pad and one-button activation. Indoor tangential fan for quiet operation. Automatic 2nd stage electric heat. Easy pull-out filters. Random restart delay after power outages. Indication LED temperature readout and fan operation. Transfer fan on the low voltage terminal board allow for an external fan connection (B14-620 wire harness kit required for this option). Front mounting hole is provided to secure the front to the chassis. Emergency management system features: temperature setback, door switch and motion sensor low voltage terminals, and serial port interfaces. May require G22-891 wall receptacle. 5.0 kW heater. Type: A/C; BtuH Cooling: 11,900; Strip Heat BtuH: 17,100; EER: 10.4/10.5; Air Delivery CFM: 290; Dehumidity Pints/Hr. : 3.6; Current Amps Cooling: 5.7/5.7; Min. Ampacity: 27.5; Overcurrent Protection: 30; Width: 42″; Height: 16-1/6″; Depth: 20-3/4″; Shipping Wt. Lbs. : 119; Wt. Lbs. : 102. 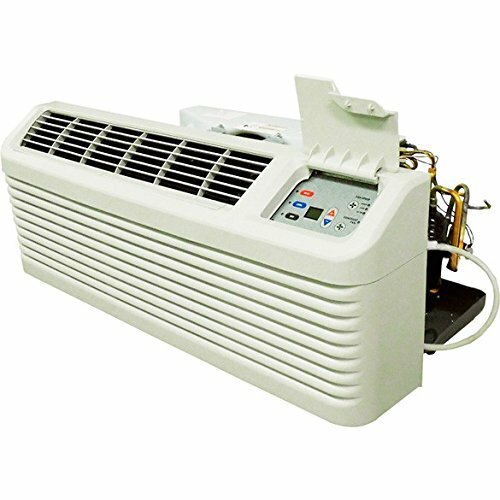 Amana DigiSmart Packaged Terminal Air Conditioner PTAC #PTC123G50AXXX is a good product. You’ll like Amana DigiSmart Packaged Terminal Air Conditioner PTAC #PTC123G50AXXX. You can read more details of Amana DigiSmart Packaged Terminal Air Conditioner PTAC #PTC123G50AXXX at text link below.